We have year round availability for 7 nights at the resort. It tends to get very hot in July/August and January/ February can be a bit unsettled. Generally the Spring and the autumn are best for beautiful sunshine and pleasant temperatures. Please bring towels for the beach and your own toiletries and cosmetics. Towels are provided in the ensuite Madyafah Chalets – if staying in a Domed Canvas Tent or Mandarah Stone Hut please also bring bathroom towels. You will find a set of clean sheets and pillowcases on your bed. Only towels left on the floor will be taken for laundry. Blankets are provided in winter months. Upgrades to our Deluxe Chalets are available for an extra €45 per person per week, to include air-conditioning, tea/coffee making facilities and a mini bar in the room. Chalets are normally semi-detached, sharing front and back terraces and are spacious enough to accommodate a third bed if you wish to share a triple room. Families may wish to do this, or take two adjoining Chalets. Egypt is in the arid desert belt and is very hot during the day, cooling at night in summer and warm during the day but cold at night in winter (mid November – March). In winter wetsuits are necessary, and warm clothes recommended for boat trips and evenings. Watch for dehydration due to low humidity. Drink far more water than usual and add salt to meals. In towns and desert communities modest clothing is required that respects the Muslim culture. In the resorts however, dress is informal. In the summer months a sun hat, sunglasses, long sleeved cotton shirt and sun block are necessary even though you may have a cool breeze at sea. When snorkelling it is advisable to wear a white T-shirt to reflect the UV rays. In the winter months, you will need warm clothing in the evenings. There is generally a mobile phone signal on site. The larger resort has internet access, satellite phone and fax. As a guest you can be contacted for emergencies on: Tel & Fax : +20-195-100 262. Where possible we will lend you a local mobile phone so we can stay in contact cheaply! If you need anything during your stay please call/text Khaled Said on +20 104 444 489. Please use one of these numbers to let us know if you have any travel delays so we can inform the driver who will be meeting you. Although the currency in Egypt is the Egyptian Pound we suggest that you bring Euros cash because most prices are in Euros and they are accepted everywhere. At the resort you can pay in Euros, by credit card and with travellers cheques – there is a 5% charge on credit card transactions and 1.5 % on travellers cheques. Please note debit cards are not accepted on site. All purchases in Egypt are subject to 10% sales tax on top of the shown price. Cash can be withdrawn from a cash machine at a neighbouring resort and although we can assist in providing transport, it is recommended that you bring all necessary cash with you. In the water: We are deeply committed to preserving the coral reefs and marine life. You will be asked to comply with the local regulations pertaining to this. Bottled Water You can purchase your own water bottle which can be refilled with free cool mineral water at various points around the resort to minimise plastic waste. On land: Please use washing water sparingly and refill your drinking bottle from the water stations. Staff: We work with local Egyptian companies for all our programmes who employ local people and work in environmentally respectful ways. The buildings at the ecovillage are built with local stone in the traditional manner by local artisans. There are no swimming pools – please enjoy the warm clear sea. 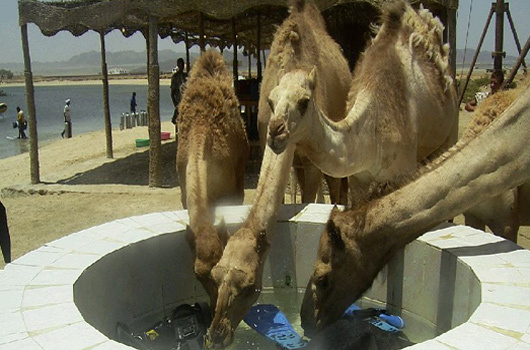 Red Sea Diving Safari have received awards in 2002, 2003 and 2005 for promoting Nature Conservation both under and above water in their building concept, service, comfort and safety of their guests. The ecovillage has full electricity, the sockets are 2 pin European style. You can book your flights from here, after we confirm your reservation. For non-UK departures, flights leave from major airports in most countries in Europe and Scandinavia. Let us know your proposed travel times and we will make the holiday reservations and arrange transfers to suit you. Guests will be supplied 3 meals a day with cake in the late afternoon. The food is basic but wholesome. Guests are asked to tell us in advance if they are vegetarian or have special dietary requirements. Soft drinks, mineral water, tea, coffee, hot chocolate are included free and Egyptian beer is available at approx. 2 Euros. Bottled drinking water is freely available and the bottles can be refilled at the water stations in every dining area and shelter (saves on plastic pollution). Also available: Ice cream, fruit juice, espresso, crisps and souvenirs can be purchase from the cafeteria. All the extras should be paid for in Euro cash at the end of your stay. Please bring any personal medication, a basic First-Aid kit, insect repellent, rehydration sachets and sun-block. The resort has high standards of hygene but short-term diarrhoea can occur because of the different diet and water in egypt. Clean your teeth only with bottled water. Always check the seal is still intact. At the onset of diarrhoea drink as much fluid as you can to offset dehydration, avoid alcoholic drinks, take Imodium or something similar and rest. Symptoms should clear up in less than 12 hours. Grapefruit seed extract, available from Health Food shops is an excellent preventative. Seasickness tablets are recommended if you think you might need them. The sea is calm when the boat is still in the reef, but it rollls a little when on the open sea. The Ecovillage has a comprehensive medical kit and an ample supply of emergency oxygen. Guests should take great care with minor cuts and scratches as the coral polyps can aggravate and cuts can easily turn septic. Ask the staff for antibiotic powder and make sure that the wound is dried between swims. Dehydration is easily avoided by drinking far more water than usual. Please get medical advice before booking if you are pregnant, over 60 years of age, have endured an injury or operation, or have any doubts about your fitness or ability. We may ask to see a letter from your GP if there is any doubt. There is a doctor on the main site (Shagra) and a modern hospital in Hurghada (approx 4 hours transfer). Please ensure you have fully comprehensive Travel Insurance. We recommend you bring Euros or £ sterling cash or traveller’s cheques. Please settle your account at the end of your stay. The only likely on-site purchases are ice cream, beer, equipment hire, diving courses, extra boat trips and excursions, T-shirts & sweatshirts and souvenirs. On-site and excursion prices are in Euros, and the local shops will take any currency. On-site payments should be made in either Euros/£sterling cash or travellers cheques. There is an Egyptian Marine Park reserve environmental tax of 15 Euros per person per visit to Dolphin House reef (from 6 years old). There is a 5% charge on credit card transactions and 1.5 % on Traveller’s Cheques on site, and debit cards cannot be accepted. All purchases in Egypt are subject to 10% sales tax on top of the shown price. Passports must be valid for 6 months after your departure date from Egypt. Scuba diving for qualified divers can be booked on site. You will be asked to show your qualification card so bring it with you. Introductory Dives for unqualified divers and beginners are available and can be booked on site. If you wish to learn to dive it is best to book for 2 weeks. The PADI Open Water course will qualify you to dive anywhere in the world. Please ask our office for details. There are sharks in the Red Sea and you may be lucky enough to see one. Around the reefs you may spot small Nurse sharks, Lemon sharks, and Black or White Tipped Reef sharks. They are not dangerous to people and we have never had any incidents with them, though the divers swim with them almost every day. The incident in Sharm el Sheik was in fact due to the divers there “baiting” sharks which caused uncharacteristic behaviour as they thought the humans had food! This practice has been banned with a huge penalty for anyone caught. This does NOT happen in the southern Red Sea. Wetsuit (March & Apr and Oct & Nov), mask, snorkel & fins. Although you can hire these it is better to have your own that fit you properly (no child sizes for hire) It helps if YOU have snorkelled before or practice before you go to feel confident in the water with mask, snorkel and fins. There are guides who can teach you on arrival, but prepartion means you can be with dolphins immediately! The ecovillage sells beer and wine, you may also want to bring duty free with you. There are few shops locally so you need to bring everything with you. Full wetsuit per day: 7 Euros. Half wetsuit per day: 4 Euros. Mask & snorkel per day: 3 Euros. Booties per day: 3 Euros. Fins per day: 3 Euros. We recommend a tip of about £20 per guest or the equivalent in Euros or local currency per week. There is a collection box for tips for the dive guides and staff in the cafeteria or reception, which is divided between the shore based staff. Boat crews and drivers are not included, you may wish to tip them personally on the day. The transfers to the Ecovillage are from Marsa Alam airport or Hurghada airport where the Wild and Free driver will meet you outside the terminal building, holding up a Wild and Free sign. He will transfer you to the Ecovillage. The journey takes between 30 – 60 minutes from Marsa Alam or 3.5 – 4 hours from Hurghada. We suggest you bring some snacks for the journey. He will offer you a cool drink. TRAVEL INSURANCE: You must have comprehensive travel insurance. Insure and Go is one of the UK’s largest travel insurance providers. They have an excellent on-line booking facility, you can obtain a quote, take out a policy and receive all their documentation via email within minutes. UK residents only. No vaccinations are officially required for travelling to Egypt. However, we suggest that you check with your GP as to what they recommend. You will also find helpful information on www.traveldoctor.co.uk Useful telephone numbers include MASTA at the London School of Hygiene and Tropical medicine (0891 224100) and the British Airways Medical Advisory Service (01276 685040). An Egyptian visa is necessary for visiting Egypt. If travelling on an EU passport, visas can easily be obtained at the airport on arrival. The cost is approximately £16 per passport in sterling or 20 Euros or $28 US dollars (this is subject to change, please check before departure). Your passport has to have 6 months validity on it, You do not need a passport photo or application form. If you are travelling on a non-EU passport you must arrange your own Egyptian visa prior to arrival. In the UK visas can be obtained from the Egyptian Consulate Visa Section, at 2 Lowndes Street, London, SW1X 9ET. Telephone: 0906 5508933 for recorded information or 0870 005 6715 for advice. The office is open Monday to Friday, between 09.30 and 12.30 midday. They operate a same day collection service between 14.30 and 16.00 hrs. Payment is by cash or postal order and a passport photo is necessary. Allow four weeks for a postal application. Non-EU passport holders should check with the Egyptian consulate. "Imagine having dolphins, beside you, below you, and almost leaping over you because they wanted to not because they had to. An incredible holiday that we hold very dear to our hearts and we hope to return again soon. Thank you so much."